In Wichita Falls, he is offered a $50 gold piece to deliver a young orphan to her relatives in San Antonio. Four years earlier, a band of Kiowa raiders killed Johanna's parents and sister; sparing the little girl, they raised her as one of their own. Recently rescued by the U.S. army, the ten-year-old has once again been torn away from the only home she knows. Their 400-mile journey south through unsettled territory and unforgiving terrain proves difficult and at times dangerous. Johanna has forgotten the English language, tries to escape at every opportunity, throws away her shoes, and refuses to act "civilized." Yet as the miles pass, the two lonely survivors tentatively begin to trust each other, forging a bond that marks the difference between life and death in this treacherous land. Arriving in San Antonio, the reunion is neither happy nor welcome. The captain must hand Johanna over to an aunt and uncle she does not remember--strangers who regard her as an unwanted burden. A respectable man, Captain Kidd is faced with a terrible choice: abandon the girl to her fate or become--in the eyes of the law--a kidnapper himself. 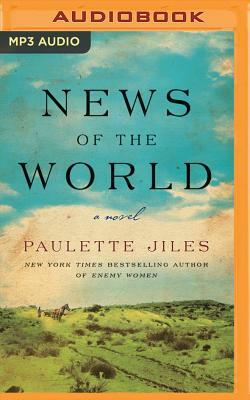 Exquisitely rendered and morally complex, News of the World is a brilliant work of historical fiction that explores the boundaries of family, responsibility, honor, and trust. Learn more about our upcoming events.